As you taste your way across the McLaren Vale Wine Region, you will uncover the stories behind the wine and the wine labels. Here’s a few quirky wine labels that caught our eye. Look closely next time you pick up a bottle from Gemtree’s biodynamic Phantom range. The label features winemaker Mike Brown in camouflage. Spot him if you can! Each year the blend changes and each unique label Mike is painted (head-to-toe) and photographed against a distinctive backdrop in the region. From the Port Willunga caves to ramshackle sheds on country properties. It’s quite spectacular. When Andrew and Lisa Wood created the wine labels for their series of Reserve wines, things got personal. They call the trio of wines The WayWood Years, a celebration of the couple’s decision to follow their dreams. “The labels represent an evolving roll of film and feature images from our years of travel,” says Andrew. 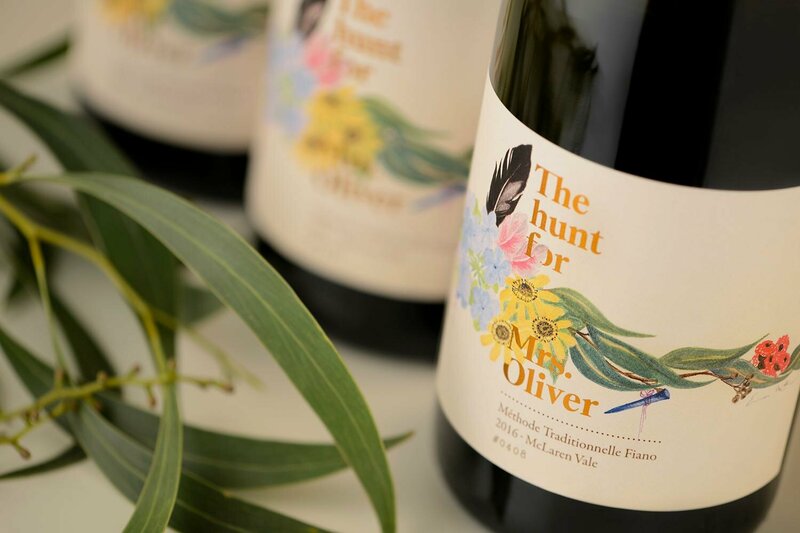 “New Fiano Methode Traditionnelle ‘The Hunt For Mrs Oliver’ is an ode to our gran Marjorie,” says winemaker Corrina Wright. “She is the family matriarch, crowned with a floral garland representing the flowers she loves, as well as a number of little hidden things that represent her.” Look closely to spot personal touches such as feathers, needle and thread, pegs, and golf tees. To bring the label design to life they collaborated with Emma Hack, local celebrated body painter and artist. “We love the result,” says Corrina. Part of the Battle of Bosworth winery, Spring Seed Wine Co. is fully certified ‘A’ grade organic. The labels are all modelled on vintage seed packets, the beautifully detailed drawings a homage to the very committed and beautiful processes of organic winemaking.